Izyaslav — Soviet Tier IV destroyer. Developed from the legendary Novik-class destroyers, Izyaslav was one of the largest and most powerful destroyers in the Russian Navy. Compared with her predecessors, she was armed with more powerful artillery. Izyaslav was surpassed in torpedo caliber by foreign-built destroyers of her time, which was partly compensated by the number of torpedoes that could be launched in a broadside salvo. 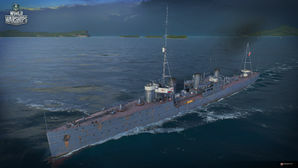 Compared to its predecessors, Izyaslav is the first ship to introduce players to the gunboat playstyle the Russian destroyers are known for. While the torpedoes are substandard, the guns are quite impressive. While their low caliber 102mm cannons may not seem imposing, they are more than capable of causing substantial damage to the targeted ship. Generally, most players will ignore Izyaslav, disregarding it because of its slow, short ranged, and low damage per torpedoes. The 102's high rate of fire and decent fire chance allow Izyaslav to constantly cause damage (while mostly low rolls because of the low caliber of the main battery, the high rate of fire makes up for it) and generally be an annoyance to it target. With proper skill and maneuvering, Izyaslav is capable of soloing battleships like Kongo. Bottom line: Izyaslav is a solid gunboat that, with some skill, can perform a wide variety of battlefield roles with its versatility. Great main battery range for a destroyer of its tier. Good rate of fire and ballistics. Excellent maneuverability and decent (if unimpressive) agility. If she can get in range of a target, her torpedoes have a quick reload time, forcing opponents to maneuver or risk taking heavy damage (if not losing their vessel due to the sheer number of torpedoes being launched). Solid improvement in torpedo range over Tier II and III. Torpedoes are still worse than equal tier American, German, and Japanese destroyers in all aspects except reload speed. Turret traverse is a bit slow, but not awful. AA defense is nonexistent, but it's not a huge concern at low tier. The Izyaslav class (Russian: Изяслав) were a class of destroyers built for the Baltic Fleet of the Imperial Russian Navy. They were modified versions of the Orfey class built in Russia with the assistance of the French Company Augustin Normand. These ships fought in World War I, Russian Civil War, Estonian War of Independence, and World War II. The Model 1912 torpedoes are incompatible with the ship's original 1917 hull. They require the Hull (B) (which is a 1937 configuration). The actual Model 1912 torpedoes had either a 3.0 km range traveling at 39 knots, or 6.0 km range traveling at 29 knots. Four 12.7 mm DShK machine guns, which Izyaslav — then renamed Karl Marx — received in 1939-1941, are missing. This page was last modified on 9 May 2018, at 14:07.